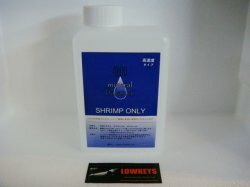 GH mineral balance controls tap-water that lack of hardness, and rises hardness of water to the appropriate numeric so that shrimps are kept. This is made from 100% natural ingredients. The hardness of water rises 3.0 per adding 1ml GH mineral balance for 10L water. This is condenced for exporting.